Attention Mystery/Thriller Buffs: Just a couple more weeks and it will be at your theater! 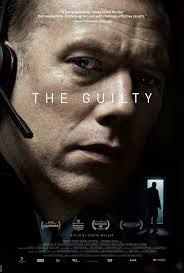 This morning Ciwt's Cinema Club screened The Guilty, a Danish movie guaranteed to wake up even the sleepiest attendee. From the moment it begins you realize you need to listen to every word, every sound, every expression of the superb actor who is on the screen in close up from beginning to end. Gripping without being scary, intelligent, deep and totally comprehensible with nice, clear, easy to read subtitles. When did you last see a truly masterful cinematic thriller? It is coming! !